Each year, Chinese for Affirmative Action dedicates a night to honor the social justice movement work that our community and staff have done. For our 49th annual dinner, we honored the accomplishments and work of Steve Owyang, New American Media and ASPIRE. Each of our honorees demonstrate how community power is key in making positive social change. 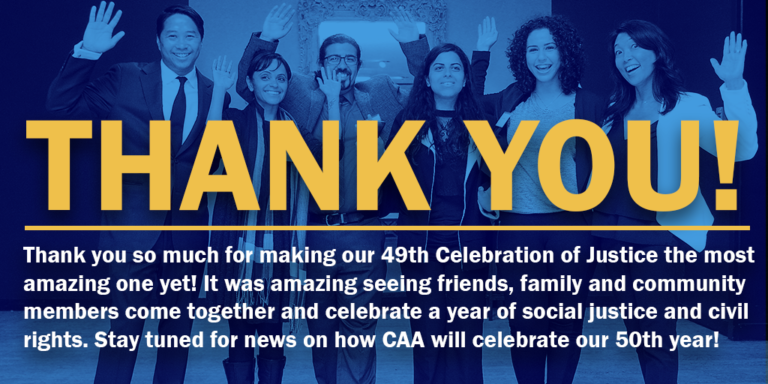 We also want to thank the over 400 individuals for attending this year’s dinner. Given our political situation, it was heartening to see so many familiar faces who have not yet stopped believing in an equal future. With your help, we were able to raise nearly 187,000 dollars. This funding will help us continue the legal and workforce services we provide to limited English proficient community members and our policy and advocacy work on the local, state and federal level. Stay tuned as we announce how we are going to be celebrating 50 years!